It is time to paint! Let's see...we will need a piece of nice white paper and a pencil to sketch. Of course, we will need brushes and paint. 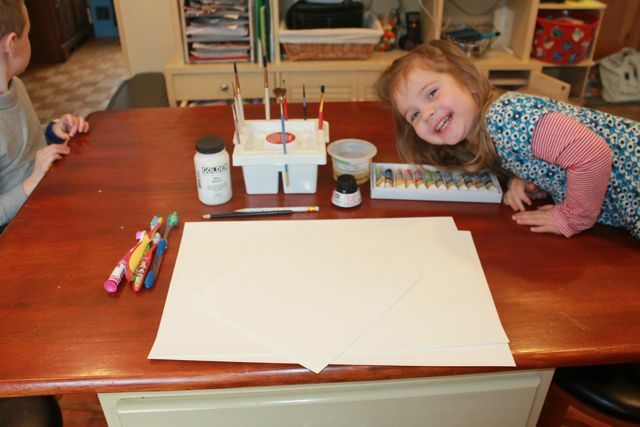 Maybe we will use gouache today. We should have black india ink or a few black prismacolor pencils just in case we want add some lines to our painting. 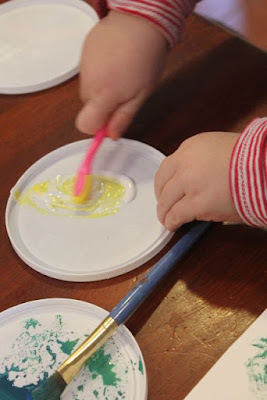 We can't forget styrofoam plates to put our paint on and a little bowl of water for our brushes. That should be everything. Wait! We need one more thing. Toothbrushes! This week we learned that Lynne Avril uses a toothbrush when she illustrates her picture books. 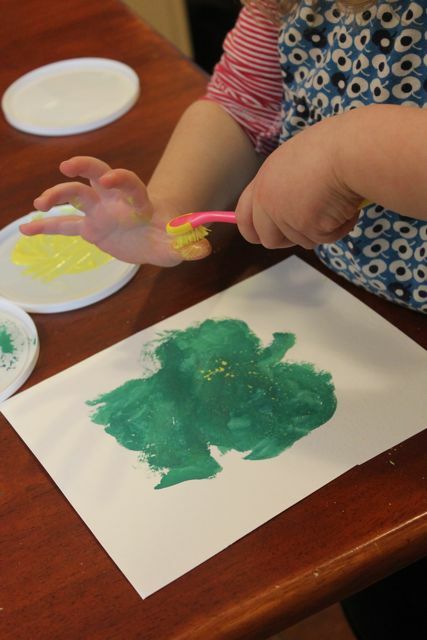 "My favorite tool, I think, is the toothbrush that I use to splatter paint with. 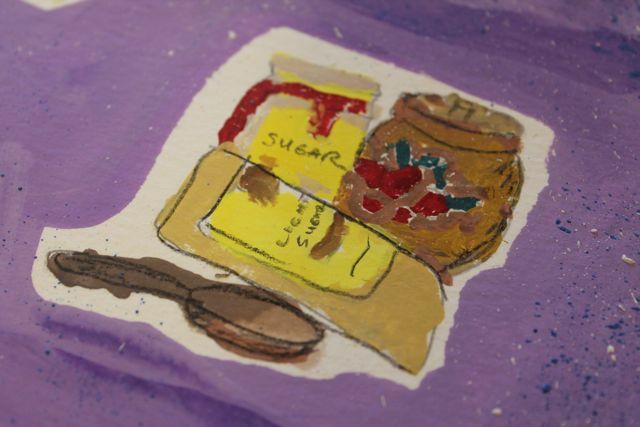 If you look closely at my work, you will see lots of little splatters, and that is done by mixing gouache paint with acrylic matte medium and flicking in onto the paper with the toothbrush." (Simply Messing About). Flicking and splattering paint sounded like the perfect way to celebrate Lynne Avril's birthday. What should we paint? Sometimes knowing what to paint is tough, but Lynne Avril helped us with that too. 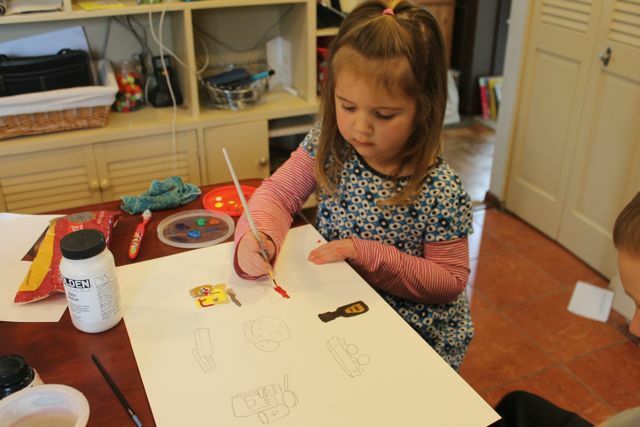 She certainly knows how to cook up a delicious painting! 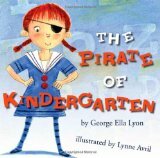 Lynne Avril has illustrated over eighty books for children including Every Cowgirl Loves a Rodeo by Rebecca Janni, I'm Gonna Climb a Mountain in my Patent Leather Shoes by Marilyn Singer, The Penny Pot by Stuart J. Murphy, and The Pirate of Kindergarten by George Ella Lyon. 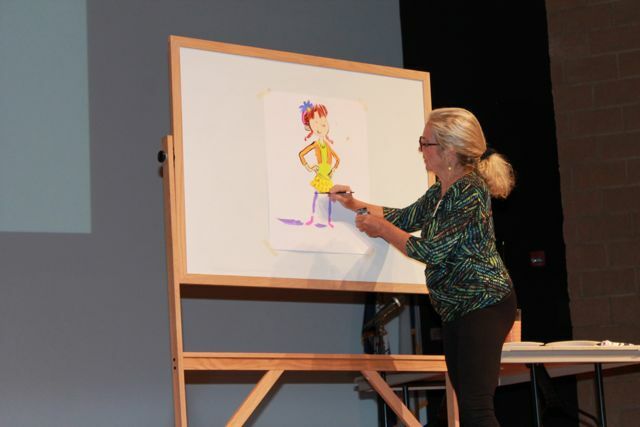 In 2014, at the Mazza Museum, Lynne spoke about her path to becoming a children's book illustrator. 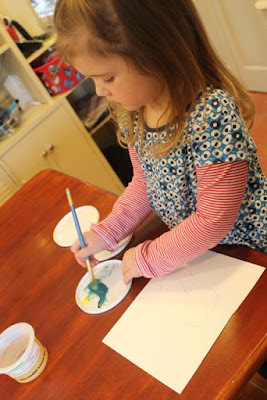 She credited her father with being her first art teacher and also a sixth grade teacher who helped her see herself as an artist when she allowed her to stay in during lunch and after school to do watercolors. Later, she studied art at the University of Montana, but she struggled to find herself as an artist after college. "I always carry my sketchbook with me." At the age of thirty-seven, Lynne was the mother of two children and doing a variety freelance work including typesetting for local print shops. One day someone at one of the print shops told her that they had received a call from a local company looking for a children's illustrator. Lynne said, "Since, I am game for about anything, I went to the office of Josten's Learning Corporation in downtown Phoenix...I had three things to show: one birth announcement for my son, one for my daughter, and one I did for a friend's kid. As luck would have it, I got hired on the spot." (Idle Illustration). The job she was hired for was to create black and white illustrations for eighteen books! Shortly thereafter, in the early 1990s, Lynne started sending out her work to publishers in New York. 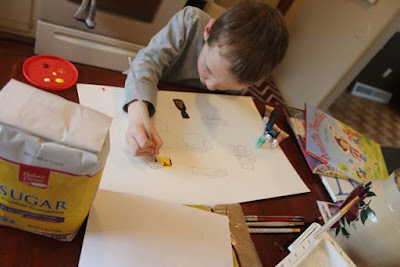 The initial response was positive, but they wanted to see illustrations with color. "So, I went out and bought some watercolors and brushes, sent out more samples." (Idle Illustration). 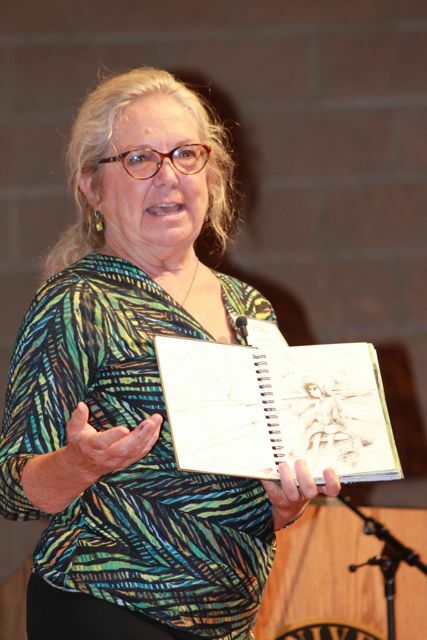 A sketch from her journal was one of the pieces that led to her first book with Simon and Schuster, Three Two One Day by Debbie Driscoll (1994). 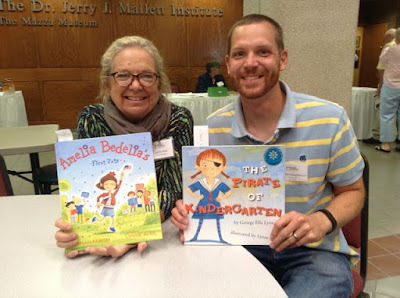 A huge opportunity came to Lynne Avril when she was one of a few illustrators being considered to illustrate a new series of Amelia Bedelia picture books by Herman Parish, the nephew of Peggy Parish. The challenge was that she needed to imagine Amelia Bedelia as a child! 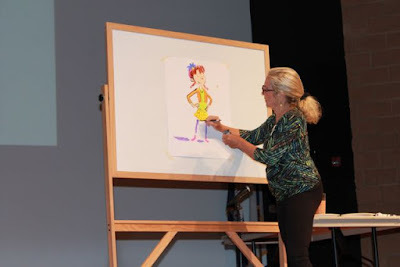 Lynne presented what she thought Amelia Bedelia would have looked like as a young girl but with a contemporary look and feel and she got the job! 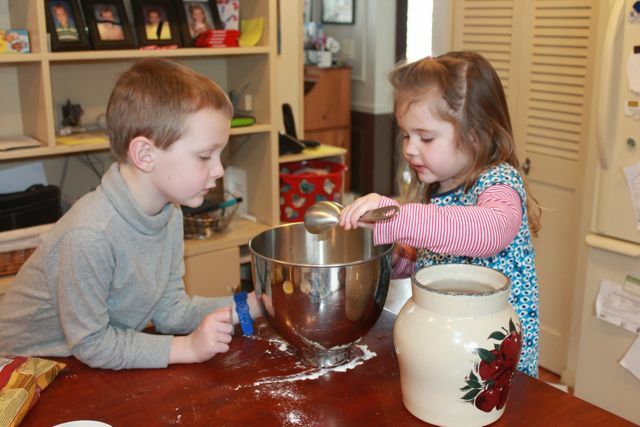 In 2009, Lynne published Amelia Bedelia's First Day of School. Since then, Lynne has illustrated five more Amelia Bedelia picture books, many I Can Read readers, and even chapter books, which have Amelia Bedelia at a slightly older age. Lynne admits that sometimes it is a challenge to switch back and forth between the different books. 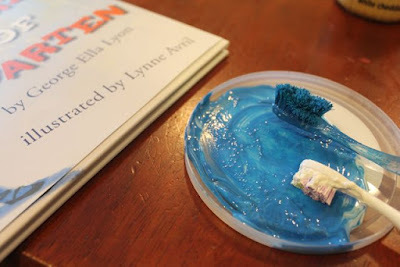 I was really excited to try the Lynne Avril's toothbrush painting technique with my children. 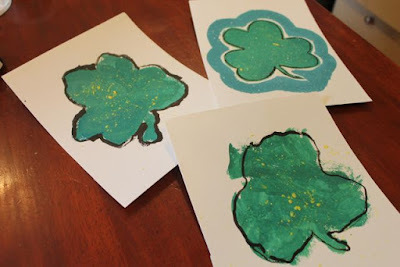 Our first attempt was making shamrocks for St. Patrick's Day. 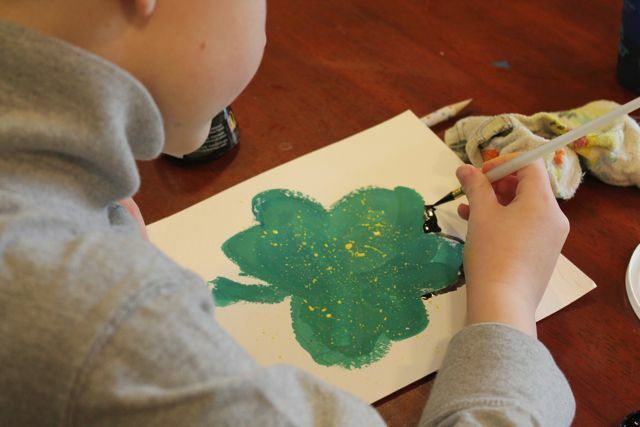 I drew a shamrock on tracing paper and then my children traced it onto a piece of watercolor paper. 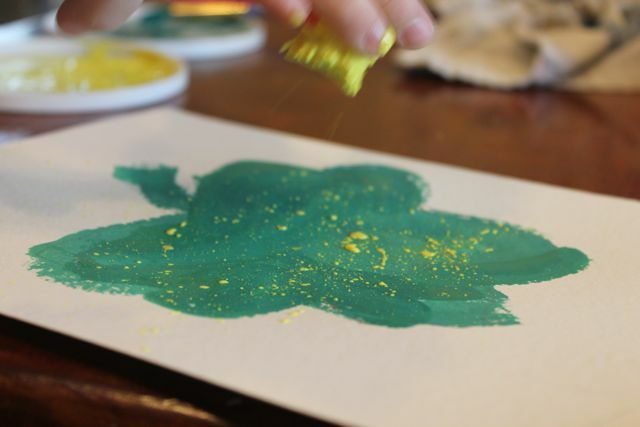 My daughter mixed yellow and blue gouache paint with a little bit of water. She was pretty excited to make this shamrock because they made some at preschool this week. After the green paint dried, we mixed acrylic matte medium with yellow gouache. She used her thumb to flick the paint. 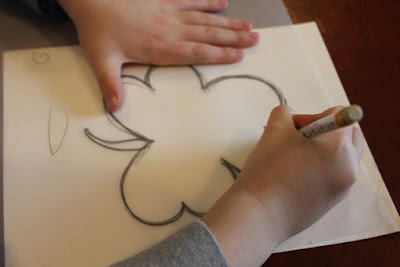 We outlined our shamrocks with india ink. 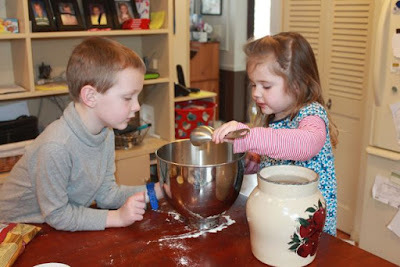 Our first attempt went well and since it was fun I thought we should try another project. It was actually an idea I had earlier in the week when I was reading through my notes from Lynne Avril's presentation at the Mazza Museum. 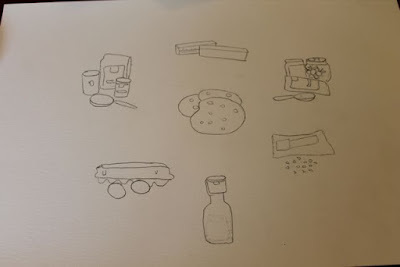 I wrote, Painting is like cooking. If you want to make something yummy, you have to put something yummy together. I did a search and found a similar quote from Lynne Avril on Molly Idle's website, "As far as color, to me that's like cooking -- making something so delicious you want to eat it." (Idle Illustration). This gave me an idea. 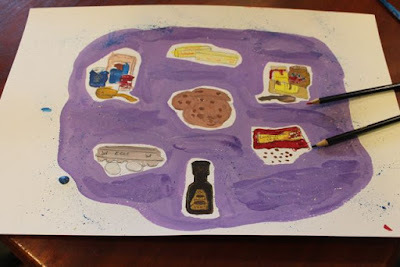 Let's paint and use our toothbrushes to make a delicious painting of something delicious! What is more delicious than chocolate chip cookies!?! I thought we could take some creative liberties with Lynne's quote, Painting is like BAKING (instead of cooking). He is getting so big! 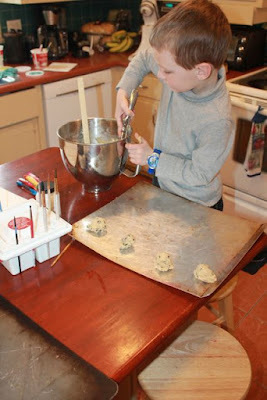 He was able to scoop out the dough all by himself! 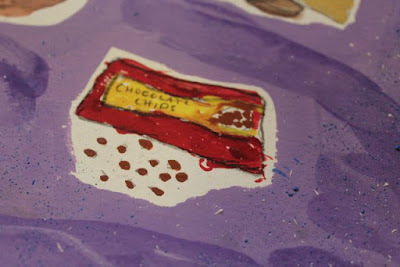 We got out all the painting ingredients while the cookies were baking in the oven. 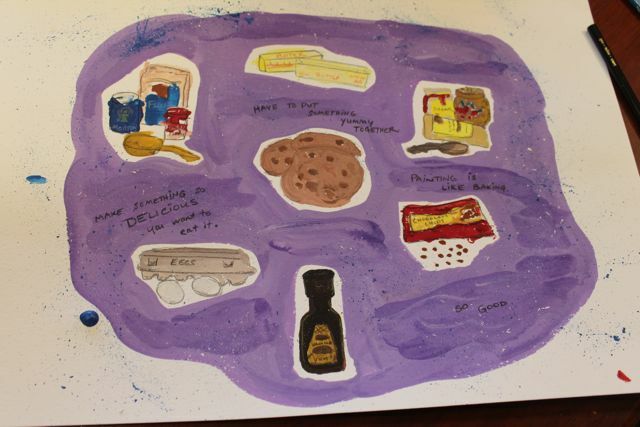 We hoped these ingredients would help us make a delicious painting. 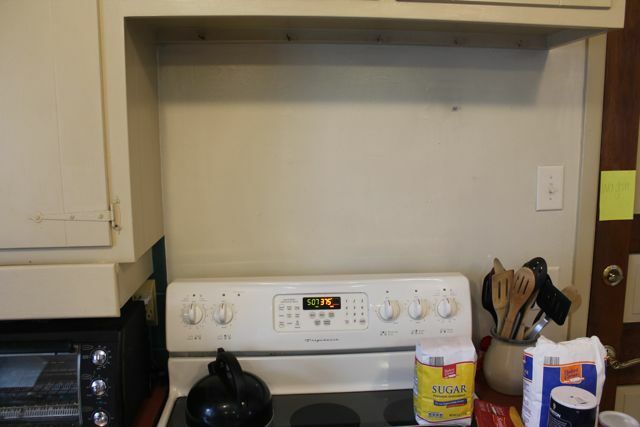 This bare spot on the wall above our stove has bothered me for quite some time. I thought this might be the perfect place to hang our painting when it was complete. 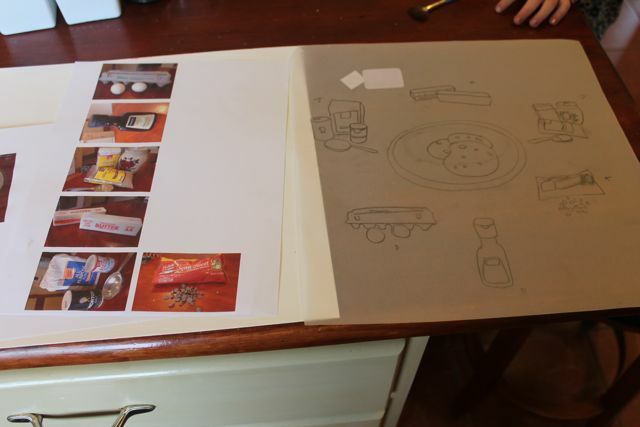 I took pictures of all the yummy ingredients we used to make the dough for our chocolate chip cookies. Then, I printed them out and traced them onto tracing paper. I transferred them to piece of watercolor paper. My children decided which items they were going to paint and went to work. We took turns painting on the same painting. We had to be patient. Later, I painted a purple background and my son and I added blue and white flecks with the toothbrushes. 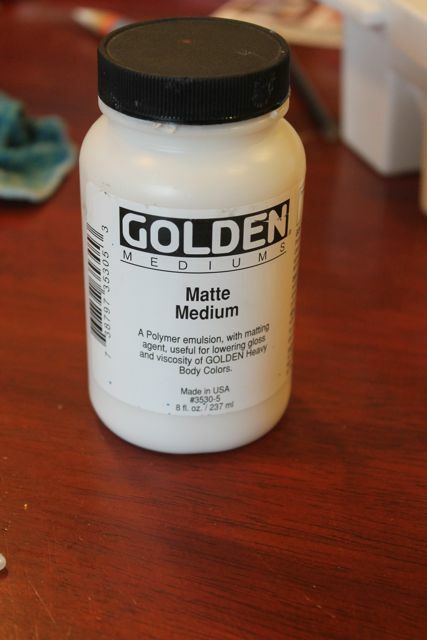 This is the matte medium we used for the splattering. I purchased it at Michael's craft store. I wish I would have bought it on Amazon. It would have been cheaper! After the paint dried, I added lines with black pencils. I wrote on the labels of the packages. I wrote the quotes from Lynne Avril too. 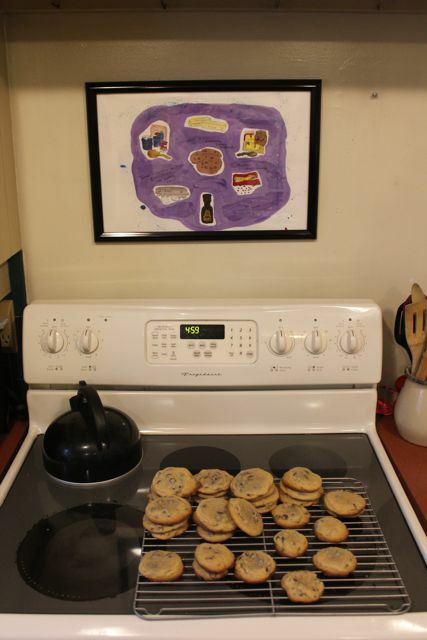 Delicious cookies and a delicious family painting! Lynne, it was a pleasure to meet you at the Mazza Museum. 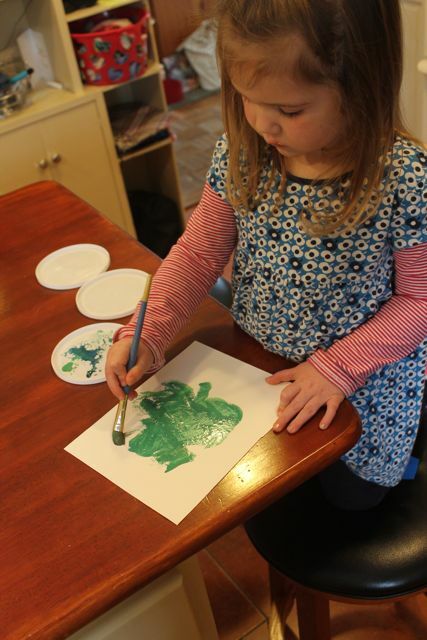 Thank you for sharing your birthday with us and for teaching us about toothbrush painting! We hope you have a wonderful birthday!